Millions of poor Americans who don't pay federal income taxes actually do have jobs. They just earn too little to pay taxes, and in some cases, to escape poverty. This is very different than the portrayal Mitt Romney offered in videotaped remarks made public this week. 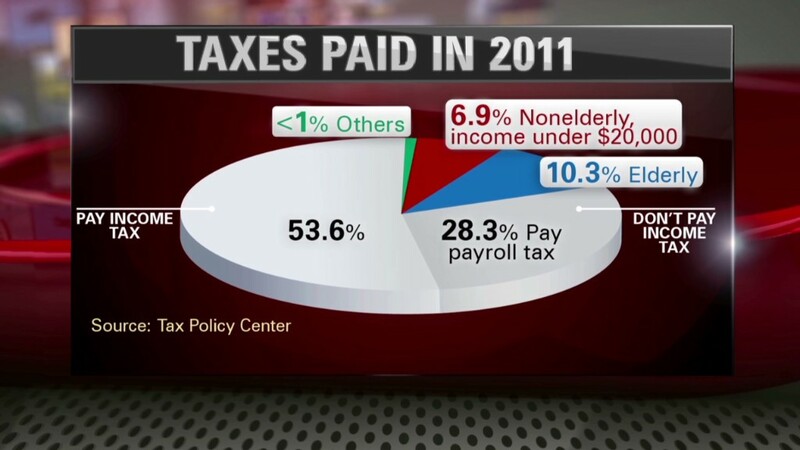 The Republican presidential candidate said that 47% of Americans pay no income tax and are dependent on the government. He said he'll never convince them to take personal responsibility for their lives. However, nearly two-thirds of the 33 million people living in families below the poverty line have at least one family member working in 2011, according to figures from the Census Bureau. The number of people working full-time in the lowest income group, those earning less than $20,262 a year, soared 17.3% in 2011. This was by far the largest increase for any income group. The poverty threshold for a family of four was $23,021 last year. But more than 30% of people who owe no income tax escape the levy because of credit for the working poor and children. Nearly 9 million have income of less than $40,000. The vast majority have their income tax liability erased by the earned income tax credit, which is designed to encourage the poor to hold down jobs. "A lot of people are working many hours, working very hard, but not making a lot of money," said Elaine Maag, senior research associate at the Urban Institute. Eligibility for the refundable credit depends on income and family size. It starts to phase out after $17,000, but a single mother with two children could earn up to $42,000 in adjusted gross income and still receive a portion of the credit. The maximum credit this family could receive is $5,200. Romney lashed out at people who believe they are victims and are entitled to health care, food and housing. However, many entitlement programs are not for the nation's poor, said Michael Tanner, a senior fellow at the libertarian Cato Institute. Among the largest entitlements are Social Security and Medicare, and the beneficiaries of those programs are mainly retirees. Many of the poor who receive income-based benefits do work, Tanner added. Nearly half of households with children that received food stamps in 2010 also had a working family member, more than three times the number who relied solely on welfare, according to the left-leaning Center on Budget and Policy Priorities. To qualify for food stamps, families must generally have a total monthly income at or below 130% of the poverty line. And workers earning the minimum wage of $7.25 an hour often can't escape poverty. They make only $15,080 a year. "They are working, playing by the rules, but it's not enough to support themselves," said Elizabeth Lower-Basch, senior policy analyst at CLASP, which advocates for low-income workers. Were you in poverty, but got a low-wage job last year that lifted you above the poverty line? CNNMoney is looking to profile you. To participate, send an email to realstories@cnnmoney.com. Include a phone number where you can be reached.